Hoof 'n Barrel: I'm In ...Are You? Okay, I had to laugh at your 'first thoughts' because my first thought was "Run away!" a la Monty Python. Maybe I watch too much Monty Python? I've been considering a theme for the year, but not monthly. I find myself 'of two minds' about most subjects, especially as I get older. But this is an area I know I need to address. It's great to have an abundance of necessities, but most of what I tend to accumulate is not in that category. I'm on an 'improve ME' campaign and this is definitely an area I could stand to improve! I've been decluttering my shop for the last 2 weekends. It's like watching a carpenter with AD. I sweep some sawdust, put away some tools, find the broken tool I was going to fix last summer, fix said tool, find a cast off piece of something that will fix the rabbit hutch door, wander off to fix said door.......I have swept 1/2 the shop floor. :) You get the picture. 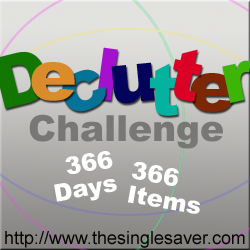 OMG, you just described the way I clean house ...which is precisely why I need to commit to this challenge. We can DO it! I think I fit right in with this crowd. For me, it's the office/craft/storage room. Paperwork, you know, bills, magazines, scraps of notes, etc. multiply like bunnies. I seriously don't know how I have so much paperwork/clutter. It just builds up until I work my way through most of it. The rest gets put aside to multiply again. Sign me up! My office is also my craft and storage room too. And paperwork is a constant thorn in my side. I always think if I can just GET it organized, I can KEEP it organized. But I always feel like I'm treading water just to keep up with it. I've made a little progress so far. I'm still working on it and there are ten more days left in January.